On May 17, 1993, Mr. and Mrs. Marchant took their daughter, Jodie, to the doctor for her 14-month checkup. Jodie was fit and healthy and meeting all her milestones, so her parents agreed for her to be vaccinated with the MMR vaccination, a decision that will haunt them forever. Mr. Marchant explained to us what happened the moment that Jodie received her vaccination: "Jodie let out a high-pitched scream and appeared to be in a state of shock. Her eyes became vacant as if in a trance and she appeared to lose interest in eating and refused all food and we had to resort to giving her milkshakes. Jodie did not recognize anyone for a long time. Note, in 1997, her then-GP was able to confirm that Jodie was okay prior to vaccination and this confirms the records were available when the GP INSPECTED THEM. Jodie stopped movement and would sit on the sofa rocking with eyes rolling and stopped talking." It appears that instead of receiving the MMR vaccine, as agreed, Jodie received a mystery vaccination. 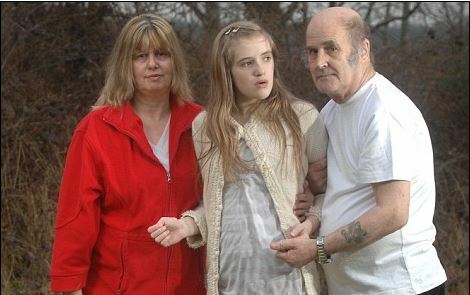 If what her parents are saying is true and Jodie did only receive one shot on the day she was vaccinated, then we need to consider whether or not Jodie’s doctor decided to mix several vaccinations into one syringe without her parents’ knowledge or consent. Whilst the majority of us would consider this to be not only unethical but also highly unlikely, remarkably, it is a possibility because, in 2013, the Globe and Mail reported that a pediatrician from Halifax was found guilty of doing the unthinkable. Doctors do what they know, but they don't know what they do. They don't know what exactly is in the vaccines that they learn to propagate to parents and to inject into babies and children. They almost never read the product inserts. Because if the did, they would stop injecting formaldehyde, anti-freeze and aluminum compounds into babies... That is, if they still can think logically. Even from before Edward Jenner's time people have seen that no one can tell beforehand how an individual will react to the introduction into the bloodstream of foreign proteins and the RNA and DNA of other species in order to be 'protected' in the future against a certain pathogen. A variolation was the ingrafting of a healthy person with the smallpox pus of a patient -- or as Jenner did, with cowpox pus or with the infectious materials from other animals -- all different substances to help 'protect' the person against being infected with smallpox at some point in the future. A vaccination is injecting a healthy individual with a cocktail of different pathogens, cultured on animal tissues). Both practices have shown to be nothing but a Russian roulette with Trojan horse bullets. This story saddens my heart, a beautiful young baby injured by an unsafe vaccine/vaccines. When will this ever stop happening to our precious children. I hope we all get justice for our vaccine injured children/adults. Every person on the planet needs to read this excellent truthful article. The series the "Truth about Vaccines" is a must see and will open your eyes to the corruption and greed that is among the people who are making these disastrous decisions. What a brilliant article to describe the utter travesty that has been inflicted upon this poor girl. It's one of the most upsetting stories I have read. Not only what the doctor did, but the fact that the family has received no compensation. The medical industry and UK government are disgusting. They truly are. People need to know what goes on, and what goes on AFTER injuries occur.